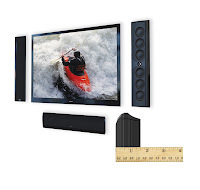 BALTIMORE – March 22, 2010 – Home audio company Definitive Technology announced it has developed the world’s thinnest high-performance on-wall home theater loudspeaker: the 1.5-inch-thick Mythos® XTR®-50. The new patent-pending product is today being offered through an exclusive online agreement with Amazon.com and Crutchfield.com. In the coming weeks, Definitive plans to make the Mythos XTR-50 available online and in stores through additional retailers, including Magnolia Home Theater, Best Buy’s high-end store within a store; Sixth Avenue Electronics; Abt Electronics; OneCall; Ultimate Electronics; Vann’s; and elsewhere. Conventional LCD and plasma televisions typically have an installed on-wall depth of 4 to 6 inches. The latest generation of premium, ultra-thin LCD flat-panel televisions uses LED-backlit technology for a better picture, with an installed on-wall depth of 1.75 inches or less. Next to these super-slim televisions, yesterday’s “made for plasma” on-wall speakers, typically 4 to 5 inches deep, look thick and out of place. 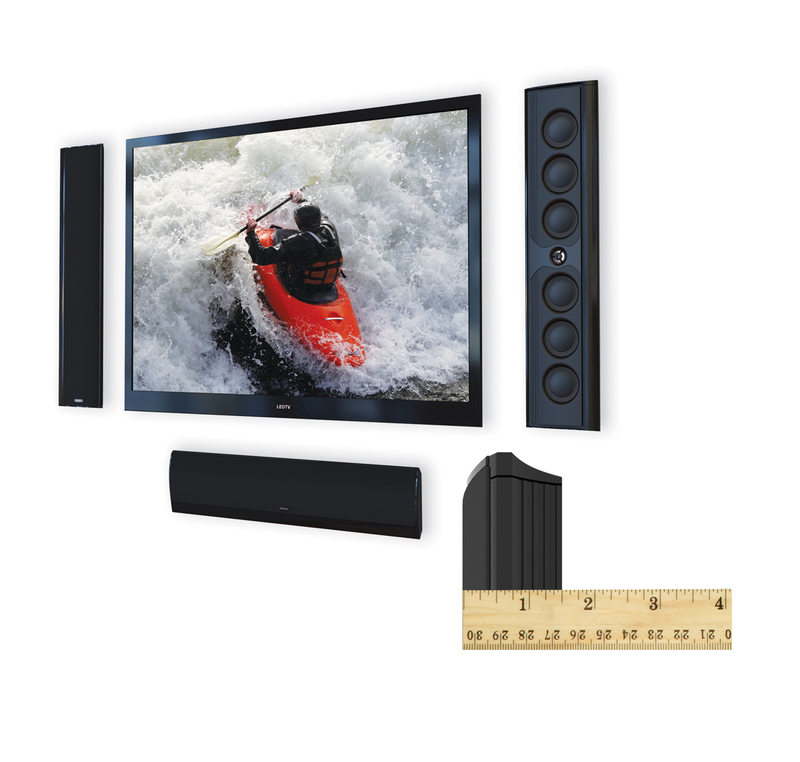 Definitive developed the Mythos XTR-50 to look great on a wall or shelf next to an ultra-thin television, with no sacrifice in sound quality. The Mythos XTR-50 offers the audio definition, detail, bass and dynamic range performance of traditional larger speakers. Shipments of LED-backlit LCD ultra-thin televisions in 2010 are expected to grow fivefold over 2009, according to figures released late last year by television maker Samsung. Definitive designed the Mythos XTR-50 to complement the demand for and aesthetic of today’s ultra-thin televisions. The company accomplished the Mythos XTR-50’s thin profile through innovative engineering of a variety of materials, including naturally strong, but lightweight aluminum. This metal has the added advantage of quickly dissipating heat. Speakers produce sound by moving air with a “diaphragm.” Most manufacturers form them into a cone shape from materials such as paper, plastic or woven fibers, but Definitive instead developed an aluminum dome that both produces sound and partly houses other components, such as a voice coil. Voice coils typically contain lengths of wound copper wire, which is an excellent signal conductor but at the trade-off of being heavy. The Mythos XTR-50 uses lighter copper-clad aluminum-core wire to offer the advantages of both. Another secret to the Mythos XTR-50’s thin profile and superior performance is its aluminum cabinet. By specially shaping the enclosure and incorporating stiffening ribs and channels, Definitive achieved a strong, rigid housing that produces no unwanted resonance. Additionally, magnets used for driving the speakers protrude through, but flush with, the rear wall of the cabinet, to minimize depth and conveniently dissipate heat throughout the enclosure. Other product components are made from polyimide film, another strong, lightweight and heat-resistant material used in spacesuits and the Apollo Lunar Module. The Mythos XTR-50 cabinet measures 27 inches high, 6 inches wide and 1.5 inches thick, the perfect size for televisions measuring 46 to 55 inches. The product comes supplied with a wall-mounting bracket that allows either vertical or horizontal orientation, with a total on-wall depth of only 1.6 inches. Also supplied are stands for vertical tabletop use and horizontal shelf placement. In January 2010, a prototype of the product was selected as the International Consumer Electronics Show (CES) Design and Engineering Best of Innovations 2010 Awards winner in the High-Performance Audio category. Products entered in the program were judged by a panel of independent industrial designers, engineers and journalists, to honor outstanding developments within 36 product categories. There was only one Best of Innovations winner in each category. More than 2,500 companies shared information about nearly 20,000 products at the 2010 CES in Las Vegas, Nev. Held each January, CES is one of the largest technology trade shows in the world. Each Mythos XTR-50 is $699. High- and low-resolution images of the product are available at http://www.definitivetech.com/HighResImages/XTR50_Press.aspx. Definitive Technology has been committed to building superior-sounding home audio and home theater loudspeakers since 1990, when the company was founded by three lifelong audiophiles and experts in speaker design and acoustics. Definitive Technology® loudspeakers are among the most positively reviewed and honored high-performance loudspeakers on the market. Based in Baltimore, Maryland, Definitive Technology is part of the DEI Holdings family of consumer-electronics brands. Audio/video specialty retailers throughout the U.S. and in over 30 countries around the world proudly sell Definitive Technology loudspeakers. For more information and the location of your nearest Definitive retailer, visit www.definitivetech.com, or call us at (800) 228-7148 (U.S. and Canada). Outside of North America, call +1 (410) 363-7148. Any trademarks, service marks and trade names appearing in this release are the property of their respective owners. Definitive has not independently verified any of the data from third-party sources contained in this press release.